I am a big fan of Julia Quinn, and I have been for at least 15 years (OMG! ), so I usually pick up her latest books. However, that doesn’t mean I don’t read them with a critical eye, and the last 4 books she’s written I’m sorry to say, I did not feel were up to her normal writing standards– in fact, I wasn’t even able to finish them and I was starting to rethink my “must buy” strategy where she was concerned. 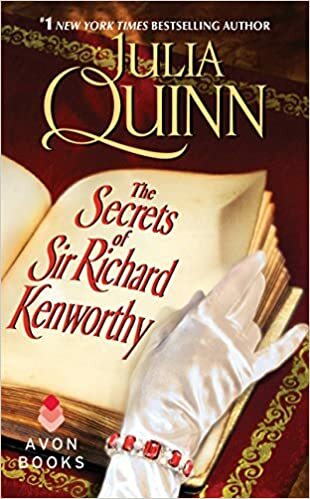 That’s why I’m really happy to say that I’m so glad she’s back in form with her latest book, The Secrets of Sir Richard Kenworthy. This book was a really fun romp– a story about an on-the-shelf spinster that no one notices, and an nobleman who must wed immediately for mysterious reasons! Richard and Iris have great chemistry and I really believed the growing love between them and his reasons for choosing Iris. The secondary characters were fully fleshed out and had individual personalities– something I love about Julia Quinn is the way she is able to do that! Though this book is on the pricier side– it’s definitely not a “Kindle Deal” at the moment– I found it to be worth the price. If you love historical romance and regency in particular, check this one out– I think you’ll enjoy it!